Yellow is a tricky color to get right. Get it wrong, and your car or bike looks like a Tonka toy truck or a fast banana. 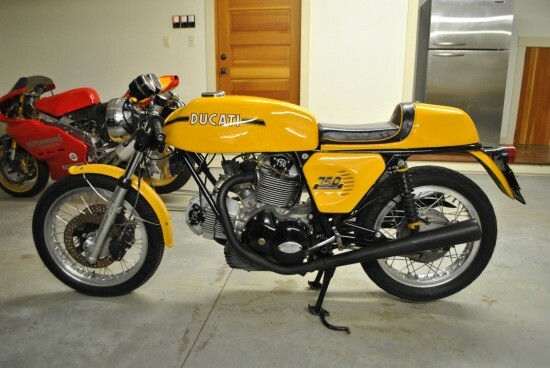 I still remember the 90’s Toyota MR2 in factory yellow, a sickly, almost-neon color that did not flatter… But of course Ducati got it right, and the yellow used on their 750 Sport is a classic, rich, almost orange color that manages to be both flamboyant and mature at the same time. Honestly though, the bike probably could have been painted up in any old shade and would still be a winner: that vivid color compliments one of the best-looking and most desirable bikes of the period. Sleek and elemental, the 750 Sport was based on the more reserved 750GT but included the usual raft of high-performance upgrades to the internals appropriate for the “deluxe” model, along with larger carburetors to feed the greedy cylinders. Interestingly, the Sport did not feature Ducati’s Desmodromic valve-actuation, which was found only on the twins that powered the SuperSport bikes. Lower-spec twins used traditional valve springs. 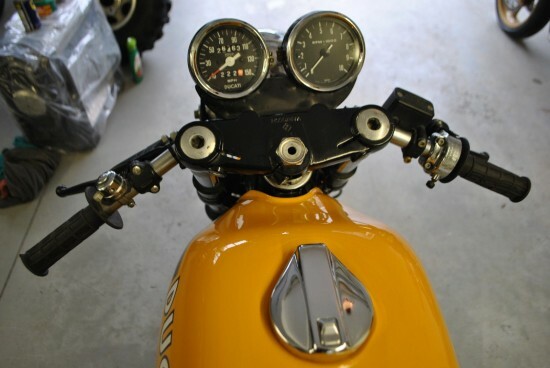 But unless you’re a Desmo fetishist, you shouldn’t care: with blacked-out cases, purposeful stance, and a sleek profile, it will still make the right noises and offer some of the very best handling the period had to offer. 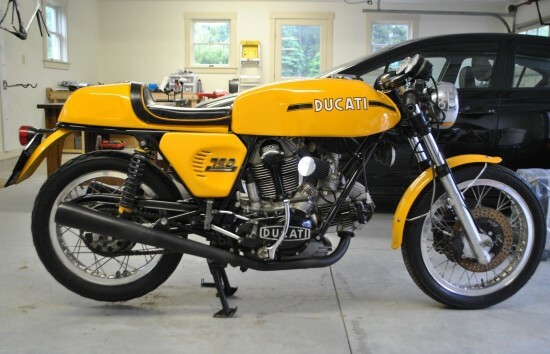 Wonderful example of a Ducati 750 Sport. 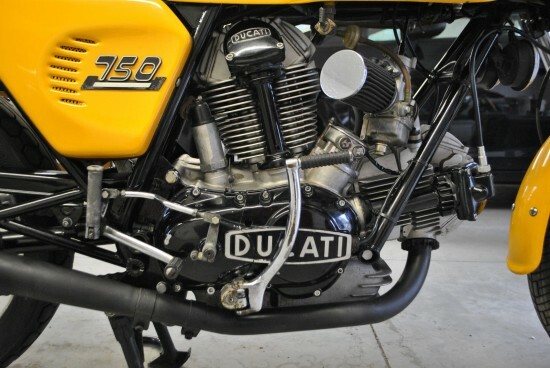 This bike appears on Robert Miller’s Ducati Roundcase Bevel Drive Engine/Frame list as bike #770 (list is available at Bevelheaven.com and includes frame/engine numbers) and is a 1974 model year as confirmed using Ian Falloon’s Authenticity and Restoration Guide. Bike has been on display for the last 16 years. Total tear down less than 1500 miles ago… frame sandblasted & powdercoated, bodywork painted & cleared, engine gone through top & bottom by Wheels Unlimited of Rochester, MN (Have all receipts for rebuild). Bike is currently shod with dual Brembos with braided SS line rather than single Scarab (original brake will come with bike as will bar end mirror), 40 mm Dell’Orto carbs, Ceramic coated exhaust by Jet Coat. Mechanically a 10. Overall in very good condition. Speedometer is currently not working, but have new speedo drive to correct. Shift linkage (externally) is a bit sloppy & could stand to be shimmed. Chrome on headlight shell has minor pitting & ring has ding…see picture. Rims are Akront. The seller indicates that the bike isn’t completely original, but the dual-disc front end is a very appropriate period modification and will be much appreciated if you intend to ride the thing. Either way, the parts are included and it can easily be returned to stock. I like the slight imperfections: it would encourage me to use it regularly, instead of parking it in my garage to slowly become a museum piece. Sharp eyes will also notice the Ducati Supermono for sale there in the background, another very desirable Ducati from a much later era. like yours nowadays. I seriously appreciate indivviduals luke you! on the web for more information about the issue and found most people will go alkng with your views on this web site. 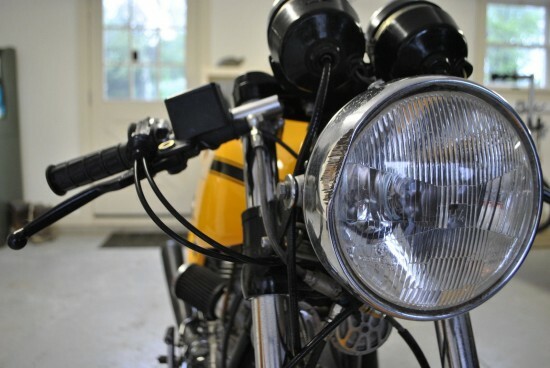 for Sale | Classic Sport Bikes For Sale. I actually do have some questions for you iif you do not mind. Could it be just me or do sokme of these remarks appear like they are left by brain dead individuals? I’d like to keep up with you. Wouldd you list of the complete urls of your shared sites like your twitter feed, Facebook page or linkedin profile? For most up-to-date news you have to pay a visit web and on web I found this website as a finest site for newest updates.